You might have already heard and seen the effects of using acupressure. Practicing it on a daily basis, to reduce stress, cold and other congestions in the body are just simply great! 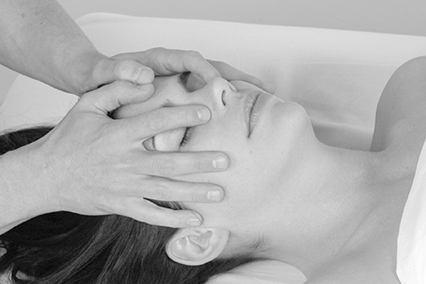 However acupressure does not only deal with the internal organs and body parts. It is not just useful to reduce pain and muscle tension in the body. 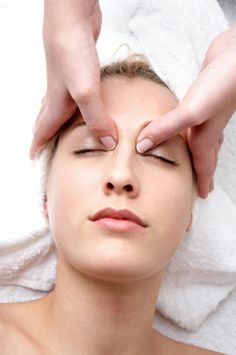 If used properly the acupressure techniques can help you gain a healthy and glowing skin. Yes, many people might have advised you a number of exercises and great diet techniques to maintain a healthy skin. But, isn’t it great to know that glowing skin is just a few finger tips away? Literally! So here is an article put together for you to help you gain a healthy, smooth and flawless skin. By using the right pressure points you can regain the long lost texture and youthful skin. 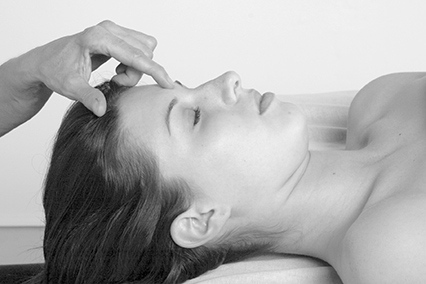 Acupressure improves the metabolism and the blood circulation in the skin. The cell that is produced in the epidermis is pushed out of the skin. This cell undergoes a process and is gradually pushed out of the outer skin. If the cycle of the cell is interrupted in between it will result in spots or dry skin. Thus, improved metabolism will help reduce the interruptions. So, don’t forget to try these simple techniques. Acupressure helps in reducing wrinkles and improves blood circulation which will leave you with acne free, lovely skin. 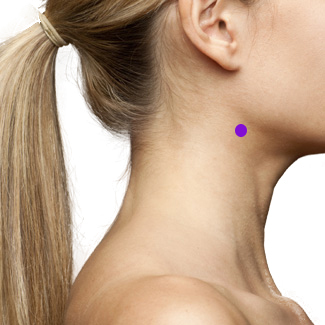 This pressure point is located at the base of the skull, where your spine is attached. Just one inch outward from each side is the heavenly pillar. 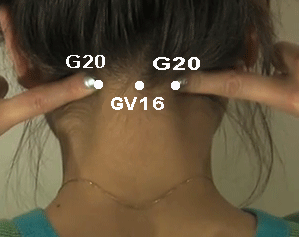 This pressure point is marked G20 in the picture. Hold this place and press if for 3 minutes. By pressing these points for at least 2 minutes every day, you will be relieved from stress related to the skin. All kind of skin disorders like acne, breakage etc will reduce. It does not just relieve you from skin problems but also helps to eliminate exhaustion, heaviness in the head, insomnia, stiff necks, eyestrain and sore throats. Located right between your eyebrows in the place where the bridge of the nose meets the center of the fore head; this pressure point stimulates the pituitary gland. The pituitary gland is the main endocrine gland which helps in enhancing the condition of the skin all over the body. Place your index finger and massage this area by pressing slightly for at least 60 seconds every day. Doing this everyday will reduce the risk of skin problems. The pressure point located a centimeter below the lower ridge of the eye socket will help in reducing blemishes. It should be right below the iris and near the cheek bone. Press this pressure point on both the sides of your face. Place your index fingers and press this point for at least 60 seconds. By accessing this pressure point you will have reduced blemish marks and acne free skin. By following this simple acupressure technique you will get clear skin. You have to rub both your hands together and make them warm. Now move four of your fingers (excluding the thumbs) over your face. Start from your forehead and reach the end of your jaws. Move back up by reaching the cheeks near the ears and work your way up to the forehead. Follow this ten times and then reverse the procedure and repeat 10 times. This massage is just perfect as it presses all the pressure points in your face, improving blood flow and circulation in the skin. This pressure point will strengthen and tone your muscles. It will help in improving the skin condition throughout the body. It is located 4 centimeters below the kneecap, outside the shin bone. Press this point with two fingers and massage it slightly in circular movements. You need to do this for 5 minutes every day. To gain glowing skin and tone your muscles. This is a effective point in the whole body. Behind the jaw bone and a few inches below the ear lobe is the pressure point that increases the luster of the skin. Press this point whenever your hands are free to experience great skin. It also balances the thyroid gland and relieves hives. Also the indention behind the ear lobe performs the same function. This is a little time consuming massage, but it is definitely worth it! This is how you go about the massage. Apply night cream on your face and press the area near the bridge of the nose above your inner eyebrows. Hold this for 10 seconds. Now reach your temples and hold them for 10 seconds. Now press the pressure points right beside the nostrils and press for 10 seconds. Repeat this same procedure 8 times every night. This will help you gain a better skin tone and you will also be completely relaxed. You will fall asleep faster than usual. 1. On the inside brow near the bridge of the nose (inside corner of the eye). 2. Press the points right next to the nostrils. 3. The point behind the ear lobe and the edge of the jaw bone. These beauty acupressure points are useful for improving skin complexion and appearance. By making them a part of your daily routine you are sure to see great results. Definitely try these simple techniques to enhance your beauty. Keep yourself healthy, happy and acne free. Enjoy the best gift of God – Life in all its beauty! Take care of your body. Thanks for the wonderful articles. I just got relief from nasal congestion and sore throat using your techniques. I have been in search of a solution for my another problem. That is unwanted hair growth on the chin. Its been since I delivered my son five years ago. It would be really helpful if you write an article and share the same. We will surely try to come up with an article dealign with this problem very soon. Wow It was very very useful. You have Explained it with pictures so well.I really loved it.May God bless you.Thank you very much. I have got lot of problems in me. I want to solve them any how. I want a proper guide on what to do and what not. I want to go step by step. Can u please lead to my daily routine? how to do the Heavenly appearance do I press or massage the jaw line and do do both sides of my jaw line? One last question What massage point is the GV16? it is behind the neck what is it for? Woww .. Useful tips .. Please help me to get rid of facial hair … Through any acupuncture technique ..
Can pigmentation be cure with acupuncture? Can melasma and pigmentation be cure?please help. it can be managed and the severity of the symptoms can be reduced. Thank you so much Mam May God bless you . I have the irregular skin tone problem the Tzone of my face is Darker what can I do to solve it .please help me . Locate the base of your skull where your spine is attached and move your index fingers outward a few centimetres on each side of the spine. This is the Heavenly Pillar point. Apply pressure here for 2 minutes every day to relive skin stress. Place your index finger right between your eyebrows above the bridge of your nose. Place pressure here for at least one minute every day. The Heavenly Glow Point is located behind your jaw bone, a few centimetres below your ear lobe. Apply pressure here for a few minutes daily, and any time you have your hands free. Activating these points can help you fix your problems. https://www.modernreflexology.com/acupressure-points-to-treat-digestive-problems/ This article should help you fix your son’s inflammatory bowel disease. Hi I have troubles with acne. Which ones of these would be the best for me to consistently do? And how long does it normally take to see results? Can pigmentation be cure with acupressure? Yes, acupressure has some amazing benefits.